I started this tablescape with some fresh cut limelight hydrangeas from the yard. They've turned that pinkish color and the next step will be brown. They are not in water and I expect them to dry like this, but they may turn a tad bit darker. I wanted the hydrangeas to go with these dishes. The dinner dish I've used many times was from Cracker Barrel (no name). The salad plate is newer from Pottery Barn called Vintage Floral, and top appetizer dishes are from Cracker Barrel. I was pleased at how well they go together. The napkins offer some rich fall tones but don't take over. Fired with a white crackle glaze to give them an authentic vintage look. I scattered small pine cones and mini pumpkins around the base of the vase. The vase is called Beehive by Juliska. I lucked out on finding that in a markdown area at a little store up in Petoskey a couple of years ago.. The Vintage cut crystal stemware is from Williams Sonoma. The kids and hubby helped me get started collecting them at Christmas a couple of years in a row. They seem perfect with these dishes. I used a square lace table topper (by Heritage Lace) to set up the look for this vintage farmhouse style table. There are 4 patterns in the appetizer dishes- this is the only one with green. The candle holders are ceramic and I also got those up in Petoskey on one of our trips. It has been raining for 3 days. Overcast and no sun expected for several more days. I used my camera on the tripod again and some of these were taken with my iPhone. I hope you enjoyed my Vintage Farmhouse October Dining table! A treat to be back and to be visiting you as well! Just imagine having hydrangeas like these in your own yard...beautiful and such an artistic way to incorporate your stunning set of dishes into your vintage farmhouse tablesetting. Today is my day to really get decorating-you talented ladies have put me to shame! Such a pretty table, love the gorgeous fall colors and flowers. Beautiful as always Liz. Your hydrangeas are gorgeous. I hope they dry in those pretty colors for you. I love the pumpkins on the appetizer plate, the white lace topper just in the center of the table and the glasses. It is fun to have help collecting dishware. Many years in a row my Christmas gift from my mom was pieces of my Christmas china. PERFECT pattern mixing!!! THIS is what pattern mixing is all about!!! Great eye!!!!! 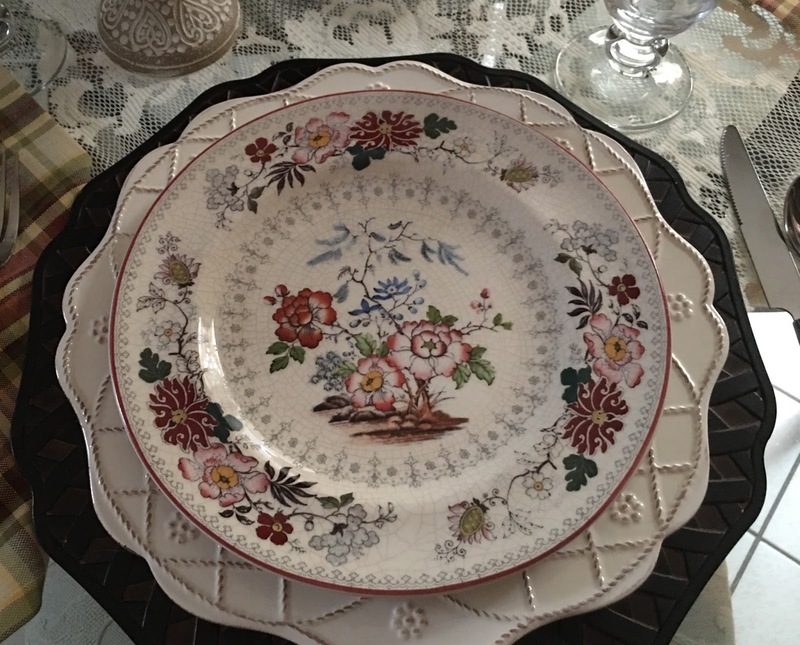 Liz, I love how you mixed patterns of dishware! The plates from Cracker Barrel are charming. The Juliska pitcher is perfect and to find it discounted is rare! Love, love, love this Tablescape! Very pretty, those two patterns do compliment each other very well. I'm not sure I would even have tried that, so kudos to you! We used to vacation at a little lake (Douglas Lake) near Petoskey every year when the kids were little, beautiful area. Those plates are so pretty! It's been a long time since I've been in Cracker Barrel and I will have to take a look in the gift section. I love the napkins and the mixed patterns, everything is lovely. You mentioned Petoskey, do you live in Michigan. I'm in Saginaw. Yes I’m in Michigan up in Traverse City. So pretty Liz. The patterns are quite lovely and do go together well. We have no cracker barrel around here. Love this vintage farmhouse table.